What are Edmonton’s best food experiences? You can’t deny it. Edmonton’s restaurant scene has heated up in the last two years and garners all of the attention when you want to indulge your inner-foodie. But what about all of those non-restaurant places, accessible by the average person, that deliver some of Edmonton’s best and most memorable food experiences? The places where you get to dive into the culture and atmosphere, in addition to the food, and it keeps you coming back for more. From the friendly young staff, to the wise Italian Nonnas, to jockeying for position at the deli counter, to the wide range of products you would only otherwise see when standing on European soil (and home to the only canned tomatoes you should be using), the Italian Centre Shop is more than just an Italian grocery store. It’s a little side trip to Europe in the middle of your grocery shopping day with a cafe, bakery, a huge selection of deli meats, cheese and olives, confectionary and more. Located in Edmonton’s Little Italy and on the Southside, Teresa Spinelli has done a phenomenal job creating an experience first and a grocery store second. Where else can you try 17 local products prepared by 17 local chefs, all paired with some of the best VQA Canadian wines, local microbrews and spirits – all for $50? While Mary Bailey, the culinary brainchild behind Indulgence bills this event as “a Canadian epic of food and wine”, it really is a very accessible, choose your own adventure food event that appeals to both diehard foodies and average blue collar lovers of food. It’s held on June 13 in 2011. Tickets on sale in May. My favourite food event of the year (yes, there are others….but many are too expensive, too weighed down by programs and talking heads, or too high-brow for the average Edmontonian). Don’t miss Indulgence. I promise you will leave happily stuffed. While I love any farmers’ market, there is just something special about the atmosphere of an outdoor farmers’ market. Maybe its one-part being out amongst the flowers and fury of mother nature, one-part having room to move, and one-part eclectic mix of vendors, buskers, food trucks and retail shops. 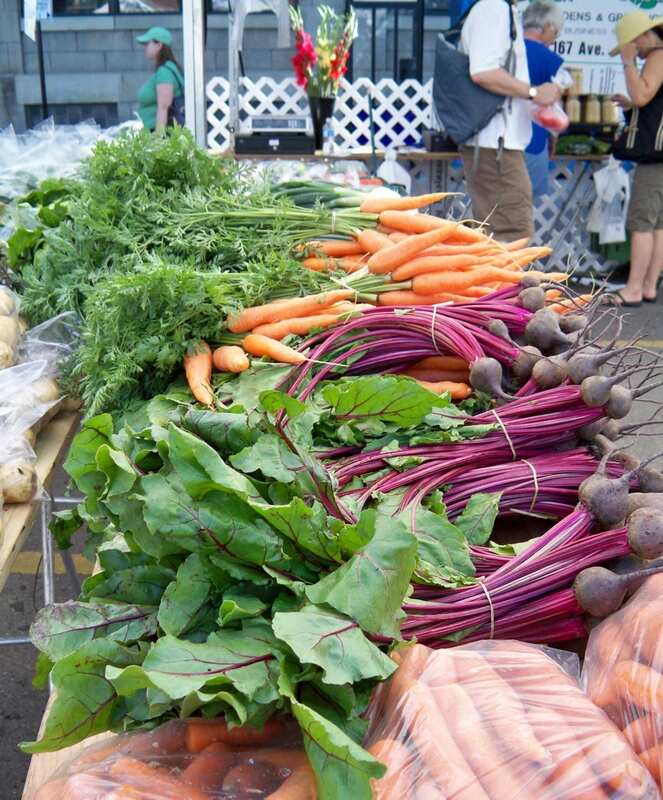 There are many farmers markets in Edmonton, including the venerable, year-round Old Strathcona Farmers Market. But my heart belongs to the City Market Downtown on 104th. It just has the right mix of everything. If you haven’t been yet, it is a must-visit stop this market season. On 104th Street downtown, just North of Jasper Avenue, from 9am to 3pm starting on May 21, 2011 through to Thanksgiving (and temporarily located in City Hall each Saturday until it returns to its true self in May). It’s an ode to our city’s multicultural DNA and a food-lover’s dream. Each August long weekend, Hawrelak Park transforms into a festival of flavours, sights and smells with the three-day long Heritage Days. With 63 different pavilions representing more than 85 different cultures (and their FOOD!!! ), where else can you take an eating trip around the world in an afternoon under a beautiful Edmonton blue sky? This year, Heritage Days runs July 30-August 1, 2011. I know Edmonton has more great food experiences. What did I miss? Tell me your favourite non-restaurant food experience in Edmonton. 2 Comments to What are Edmonton’s best food experiences? I’ve done some of the farmer’s markets and the Italian Centre. But this Indulgence event is very intriguing. Thanks for putting it on my radar. Very helpful post for the newish Edmontonian that I am. I go to the Italian Centre pretty much for my everyday shopping, having just moved here from England… they have my favourite Bonne Maman preserves for reasonable rates, and I love how cheap the cheese is. Love the idea of ‘Indulgence’ will be looking forward to the ticket release.